General Gilbert Motier, the Marquis de Lafayette, visited Newark on September 23, 1824, one of Newark's major events of the last century. The gallant, dashing Frenchman of a half-century earlier and hero of the Battle of Monmouth, was America's most distinguished guest that year. A whole nation lauded him for his support during the American Revolution, and Newark's part in this celebration was equally great. Upon arriving at the Boudinot mansion, Lafayette was introduced to the members of the federal and state court system and to distinguished members of the order of the Cincinnati. The front of Boudinot's house was richly decorated for the occasion. A huge bower measuring 35-feet in diameter and 15-feet in height was decorated with vines and flowers. Thirteen columns representing each of the original colonies supported a floral decorated dome representing the western hemisphere. The ladies of Newark were responsible for the floral motif, and William Halsey supervised the general construction assisted by Moses Ward. As Lafayette entered the park, flags waved and cannons roared, and regiments were drawn up in line with 300 infantry and 500 horses. Near the platform where the speeches were read were huge signs bearing the inscriptions, 'His laurels shall never fade; ' 'We shall ne'er look upon his like again, ' and 'For him whom a nation delights to honor.' Music and poetry flowed at every opportunity, and a patriotic address was delivered by the Hon. Theodore Frelinghuysen. In spite of the light rain that fell during the event, everybody was impressed. Indeed, many years later an elderly participant noted that Lafayette's welcome provided the greatest day he had ever witnessed. The same afternoon the general left for Elizabethtown where he spent the night as the guest of General Dayton. The records indicate: 'Such was the whole-souled and deeply affectionate sentiment of the people of Newark towards the self-enobled nobleman and patriot that whatever sort of dissatisfaction found expression afterwards was because some had not been able to pay personal tribute to him to metaphorically 'kiss the hem of his garment.'' 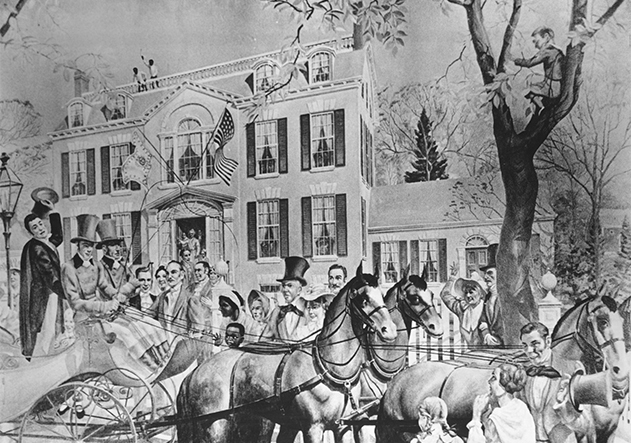 Ten months later Lafayette paid a surprise second visit to Newark during a detour in his Paterson to Morristown trip. While in the city, he stopped to visit Miss Doren's class at the Newark Academy. He also had breakfast at Morton's Hotel and visited the Third Presbyterian Church.